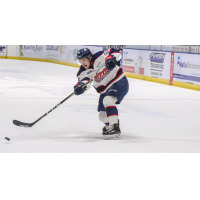 Flint, MI - The Saginaw Spirit avoid a three-game losing skid after Friday's 4-2 win over in-state rival, Flint Firebirds, at the Dort Federal Event Center. In the seventh of an eight-game regular-season series, it's the sixth straight win and fourth in Flint this year for the Spirit, who have already captured the Coors Light I-75 Divide Cup in the previous meeting back on January 2. One point shy from tying its season total from the 2017-18 season. Saginaw has earned six of a possible 10 points at the conclusion of its five-game road swing and remains within four points of the OHL West Division lead. A slashing from behind penalty got the momentum going for the Spirit at 4:08 in the first period with rookie Cole Perfetti receiving the penalty shot. Sending it through the legs of goaltender Emmanuel Vella, Perfetti's 21st goal is a franchise record for most single-season goals by a 16-year-old. Passing current Ottawa 67's forward Tye Fellhaber, who finished with 20 in the 2014-15 season, Perfetti is six away from tying Jan Mursak for the most scored among all rookies in team history. The 2018 OHL Priority Selection first-round (5th overall) pick has the third-most points (43) by a first-year player in the league. Saginaw scored twice more before the first intermission, including a tip-in from overage defenseman Justin Murray with 4:19 to play, his fourth goal since joining the Spirit via trade in early December. The Firebirds would go on the power play in the final 1:59 but a turnover in their offensive zone led to the shorthanded breakaway goal by D.J. Busdeker for the 3-1 lead. The 19-year-old winger has registered at least one point in five of the last six games. Before Arizona Coyotes goaltending prospect Ivan Prosvetov allowed a cross-ice goal to Ethan Keppen at 1:47 in the second, the 2018 OHL Import Draft first rounder made three breakaway saves to hold Flint scoreless after 20 minutes, finishing at 33. Prosvetov, commanding a goals against average (GAA) of 3.10 with a 0.902 save percentage (SAV%), gets his first win in seven days after allowing a combined 11 goals in losses to Ottawa and the Guelph Storm. The Spirit crept back to a three-goal lead at 13:05 as Camaryn Baber fired a rocket to the top of the net on backup Luke Cavallin. Baber has scored twice in the last four games and lands his first multi-point outing against the Firebirds this season. Flint would bring its deficit down to two with 4:49 left in the third period on Jack Wismer's 11th goal of the year. It'd be the second shorthanded goal of the game as both clubs were issued a 10-minute misconduct penalty and 0-for-4 on the power play. Saginaw came into Friday with the fifth-best power play unit in the league as well as ranked sixth on the penalty kill. Overage defenseman Reagan O'Grady made his return to the lineup after serving out a four-game suspension. The Spirit were limited to five blueliners with Hayden Davis out due to injury. Saturday will be the 12th annual Shocks and Saves Charity Game, presented by the Pulse 3 Foundation. With fellow Detroit Red Wings alumni and local EMTs and physicians taking the ice at 4:30 p.m. (EST) at The Dow Event Center, $13 discounted tickets are available when the Spirit host Flint at 7:05 p.m. (EST). Listen live on OHLLive.com, the flagship WSGW 100.5 FM Talk & Sports and fmtalk1005.com with Joey Battaino and Dennis Desrosiers. "Countdown to Faceoff" with host Domenic Papa starts at 6:50 p.m. (EST). $5 from each ticket sold will be donated to help save the lives of those affected by cardiovascular disease through the education and distribution of automated external defibrillators (AEDs) around the Great Lakes Bay Region.